A mysterious figure who appeared in Hollow Bastion. When receiving consecutive attacks, guards beyond the second strike. Resistant to fire, ice, lightning, and special attacks. "I can not feel—sorrow... No matter what misery befalls the worlds. No matter what you think, what you feel, or how you exist." —Xemnas to Sora and co.
Xemnas is the leader of Organization XIII, and is fought as a boss in Kingdom Hearts Final Mix and the final boss of Kingdom Hearts II and Sora's story in Kingdom Hearts 3D: Dream Drop Distance. 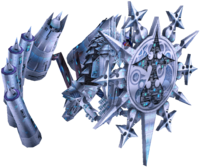 In Kingdom Hearts Final Mix he challenges Sora at the Hollow Bastion, while in Kingdom Hearts II he fights Sora at both Memory's Contortion and within Kingdom Hearts itself. In Kingdom Hearts 3D: Dream Drop Distance, he battles Sora in The World That Never Was. 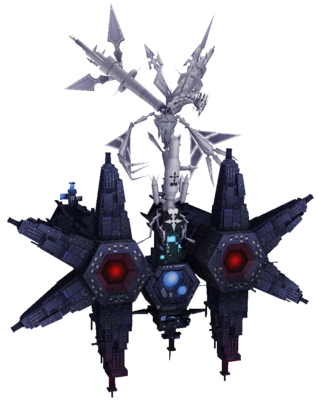 Xemnas commands a gigantic and draconian battleship during several parts of his final battle with Sora and Riku. The dragon has a small main body, a long, segmented neck, and a round head with numerous tall, thin spikes lining it. 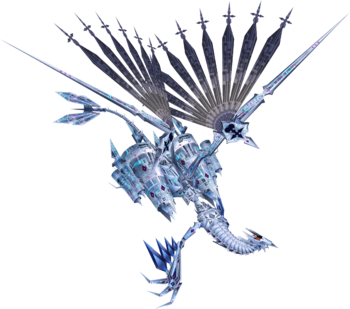 Its mouth is somewhat beak-like and Xemnas, covered in armor, sits on a throne on the top of the head. The throne is adorned with large spikes and other additives that resemble the Nobody emblem, and large, seemingly organic, orange objects connect Xemnas to the battleship. The dragon's wings are thin, angular, and each is emblazoned with a black nobody symbol at the joint. Each wing also has several thin, black and white "feathers" with tips resembling the Nobody logo. Its thin arms end in three-fingered, segmented hands and each arm is lined by four blue diamond-shaped spikes of increasingly smaller size. In place of legs, the Dragon has two massive, conical engines with two smaller engines on either side of the main ones. It also has a long, thin tail with four conical objects connected to its tip. The dragon is predominantly colored in light shades of silver and metallic blue. While commanding the dragon, Xemnas dons armor adorned with dozens of Nobody symbols. The shoulder pad on his left shoulder, helmet, crown, boots, knees, and breastplate all sport these designs. His crown and shoulder pad are gold, while the rest of the armor is colored in light shades of blue and silver. He has two silver belts on his waist and what seem to be white feathers on his right shoulder in place of armor. Several cords criss-cross in front of his torso, connecting to massive, oblong pieces of armor worn on each arm. 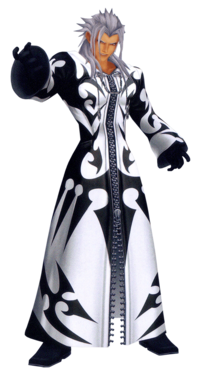 Xemnas's faceplate is beak-like in structure and he wears clawed, metal gloves. He also wears black pants underneath the armor. 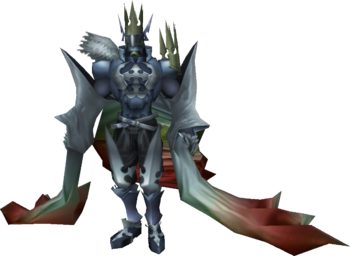 Perhaps the most striking features of this armor are the oddly-shaped "sleeves" that are attached to each of Xemnas's arms. They are a mixture of red, orange, yellow, and white. He also wears a massive, similarly-colored cape that seems to connect him to the dragon. This armored form, referred to as the Armored Controller, bears a striking resemblance to No Heart. In his final section of his battle with Sora and Riku, Xemnas's appearance is unchanged, save for his cloak. His once all black cloak is now a white one covered in black designs, many of which resemble the Nobody logo. The Armored Controller's name reflects the armor Xemnas wears and his command over the dragon. Early concepts for the Xemnas battle included two gargantuan Nobodies in place of the dragon, formed from Dark City rather than the Castle That Never Was: King (キング, Kingu? ), which had a vaguely humanoid upper body adorned in Nobody sigils and wore an immense crown, and Kentauros (ケンタロウス, Kentarousu? ), which resembled a dilapidated version of the King attached to a quadrupedal lower body, with the crown becoming a spiked ruff. At the start of the battle, immediately Lock-on to Xemnas, summon Tinker Bell, and prepare any variant of Aero available (preferably as a shortcut). This will minimize the damage Xemnas can do to Sora. He will immediately execute an energy-ball attack, which explode into orb-like, damaging force fields. While it is advised that Sora has his most powerful abilities equipped, be careful at close range, as Xemnas will counter with a damaging shield technique or a powerful slashing combo. As Sora must also be wary of his MP, Elixirs and Megalixirs are strongly recommended. After about three quarters of Xemnas's pink HP Bar have been depleted, he will begin to teleport around the battlefield, ultimately increasing his speed. Escape his energy ball or slash/shield attack by keeping track of the dark cloud that surrounds him. He also gains a deadly ability in which he curses Sora and the party, draining their health and changing the Command Menu into a rapid roulette solely showing Shock and Release. Wait for Release to appear in the menu before selecting the command to end the curse. If Shock is chosen, Sora's health falls considerably. Tinker Bell can revive Sora to full health if he falls, but that means that once the curse is dispelled, Curaga is more essential. To avoid this attack, Dodge Roll at just the right moment when Xemnas teleports, or cast Curaga, as Leaf Bracer will shield Sora from getting cursed. Once Xemnas hits his orange HP Bar, however, battle difficulty increases even further. Xemnas will summon a ring of blue Ethereal Blades in the air before him, which fire at Sora when Xemnas gives the command. This technique can be avoided through the use of Dodge Roll. When his yellow bar is almost completely depleted, Xemnas shrouds the field in darkness and surrounds himself with energy. Long-range lasers will then fire from him in all directions. Remain close to Xemnas to avoid as much damage as possible, where he'll only hover in front of Sora and thus one only needs to merely watch for the direction of the lasers in order to properly avoid them. Another option of escape is to use Superglide. 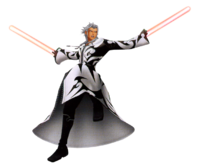 Once Xemnas uses his ultimate attack for the first time, his basic attacks become more powerful, and the Ethereal Blades he fires now glow red. Xemnas also proves more difficult than Sephiroth due to attacking relentlessly, which in turn leaves very little chances to make him flinch from basic combos. Sora can try casting Gravity because if it hits while locked on to Xemnas, he won't move or release any attack for a short time as he gets stunned and Sora will receive Tech Points. Xemnas can then be attacked, but be ready to use Dodge Roll to avoid his counterattack. The safe way to do this is attack him exactly three hits after Gravity hits him, then Dodge Roll and repeat Gravity. Also, cast the spell on him at the right time, as Xemnas might have a chance of shaking the spell off during an attack, even though Tech Points are gained, there is a chance he will retaliate hard. Xemnas will only flinch to air combos, so keep that in mind when moving in to attack him, especially if stunned. Gravity attribute attacks can easily stun him for Tech Points and can also break through his teleporting somewhat. Be sure to remove any Combo Plus abilities to access the combo finishers sooner before the battle, enabling Sora to attack with higher chances of not being interrupted. Prepare Curaga just in case Sora needs healing. With good timing, it is also possible to slide past or underneath the energy balls he fires with Sliding Dash. Should that connect, remember to combo from that to use a ground combo finisher if needed. Xemnas's final phase tends to leave less openings to attack him head on and to stun him, but there's often a free chance to make him flinch whenever he finishes using his strongest attack. Blade slice: Performs a slicing combo. Thunder guard: Creates a barrier that damages Sora if he touches it. Invitation to Nothingness: Sets a curse on Sora that continuously drains HP. Counter slice: Unleashes a quick slicing combo after guarding or teleporting. Slice barrage: Slices Sora multiple times in a long, desperation attack. When the battle begins, Xemnas will ensnare Sora in a field of energy that will slowly drain his health, then teleport to the top of Memory Skyscraper. Sora must rush to the bottom of the building and use the Reaction Command "Facedown" to break the energy field and charge up after Xemnas. Xemnas will leap down to confront Sora as he nears the top. At this point, one of three Reaction Commands appear depending on how close Sora is to Xemnas. The first is "Clash", where they pass each other harmlessly. The second is "Breakthrough", where Sora attacks Xemnas with a single attack. At the last second, the command changes to "Finish", where Sora attacks Xemnas several times and slams him into the side of the skyscraper. It's recommended to hit at "Finish". Note that not hitting Xemnas will cause him to deal damage to Sora. After the sequence ends, Xemnas will begin his normal attack pattern. 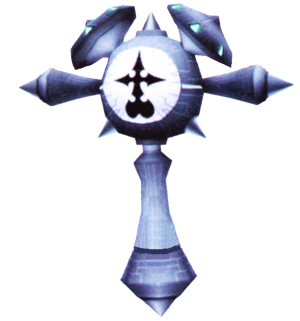 He will teleport in an orb of darkness frequently, emerging to attack Sora rapidly with his Ethereal Blades, spinning, flipping and kicking to attack from all sides. These attacks can be blocked with Guard, or more easily, Reflect. Xemnas will also project a barrier, blocking Sora's attacks and knocking him back. He can be stunned, so Sora can easily connect combos. However, Xemnas tends to teleport away afterwards or if Sora attacks him too many times, he will teleport away in the middle of the combo when reaching his retaliation point. Later in the fight, Xemnas will repeat the opening sequence involving Sora running up Memory Skyscraper. The Reaction Commands for the second time are the same as the first. As he gets weaker, Xemnas teleports more often and more quickly than before. As soon as the battle starts, Xemnas begins to bombard Sora with buildings. Use the Reaction Command to avoid damage and then pass through the doorway into the next area. Run forward and use the "Skyscraper" command to reach Xemnas's massive Dragon Ship. Sora must now knock several Bomb Bell B Nobodies into the power generators of the ship and then use "Stunt Dodge" to dodge both the generator's laser attack and explosion upon destruction. Sora then finds himself in the main core of the ship. 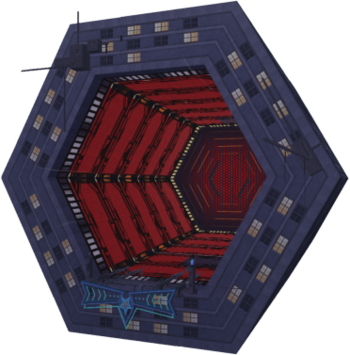 Attack the core, dodging aerial attacks from the ship's "claws" and the lesser Nobodies that spawn once the core surrounds itself with a protective barrier. Only by destroying the Nobodies does the core become open to attack once again. Use the "Proceed" Reaction Command to enter the next phase of the battle. After destroying the main core of the Dragon Ship, Sora faces Xemnas in armor. Although he remains sitting on his throne, the Superior wields a massive sword, and can also channel the attacks of the Organization members slain earlier in this game. Drive Forms can be used for only this portion of the battle and greatly increase the rate at which Xemnas's HP is depleted. Should Sora fall, King Mickey may appear and give him a second chance. After the fall of the massive Dragon Ship, it rejuvenates and teleports Sora and Riku to an alternate dimension. 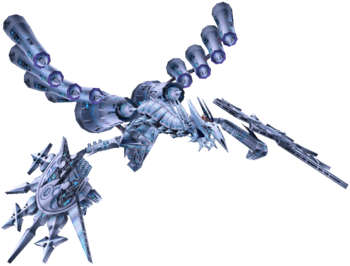 They fly to the head of the ship, where they find the stationary, armored Xemnas awaiting them yet again. He will attack with a long-range sword swipe as in the last battle, dealing a lot of damage on contact. After one bar of HP is depleted, Xemnas will slam his weapon against the floor, sending Sora and Riku flying, as well as dealing very mild damage. Xemnas will bombard Sora with lasers and buildings, so use the Reaction Commands to get back to the ship. Failure to do so will result in Xemnas blowing Sora away and dealing minor damage. Once this is done, immediately and repetitively use Aerial Dodge (mash ) in order to dodge Xemnas's next tactic, which allows him to summon snowflake-shaped energy that fires lasers and is unavoidable. Should this not be done, Sora can attempt Aerial Dodge again or merely allow damage and then fall to the point where he can safely glide ( ) back to the ship. After Xemnas's second HP Bar is depleted, these lasers will continue to fire as Sora grapples with Xemnas. Be aware that he may summon a damaging shield, just as he did in his previous battles. Regardless of his Drive Form levels, Sora has full access to each Form's ability, allowing easier movement and dodging. Riku will also heal Sora with Cure Potion if his HP falls below critical. This fight pits Sora and Riku in a Gummi Ship-style battle against a massive Dragon Ship, which is piloted by Xemnas. Only three commands are available on the menu: Attack, Drain, and Shoot. Use Drain when enemy ships fire lasers at Sora and Riku, filling the Charge Gauge. If this gauge is filled, can be used to fire a powerful Reaction Command, "Mega-Laser". This attack will, if not completely, drain large portions of the ship's HP without fail. If Bomb Bells appear near Sora, he can press to fire lasers to deal damage, but the Attack option offers higher accuracy. Shoot should only be used against enemies that are out of range. All enemies that bombard the ship via Shoot deal massive damage. Sora must first tackle the Dragon Ship's tail. Utilizing a combo of the commands mentioned above, this should hardly be a challenge. Xemnas may fire a large array of missiles and since Sora cannot heal in this battle, be sure to dodge by flying in circles to each corner of the screen. After destroying the tail, Sora must defeat the "legs" of the ship. "Mega-Laser" will come in handy here and also fly in circles to dodge the snowflake-shaped lasers that are fired. After defeating both of these limbs, Sora can proceed to the wings. Before the first wing can be destroyed, Xemnas will fire "snowflake lasers" as well as missiles. Both tactics can be dodged via flying to each screen corner. Once this is done, the command process repeats itself yet again. Defeat both wings in order to clear the battle and progress. Xemnas in his Final Form. "If light and darkness are eternal, then surely we nothings must be the same... Eternal!" Xemnas will first throw Sora and Riku into the air, leading to a series of aerial slash attacks and roundhouse kicks. It is possible however, to avoid being thrown in the air if Sora has Reflega in the shortcut menu and uses it immediately after the battle begins. These tactics can be dodged by using the "Reversal" Reaction Command. To deal minor damage to Xemnas as he teleports around, then manually select the Trinity Limit ability. This approach would then lead to the "Block" Reaction Command. It is also possible for a cinematic to play where Xemnas knocks Sora's Keyblade away. At this time, activate the Reaction Command "Defend", where Riku tosses Sora's Keyblade back to him and they both force Xemnas away. Eventually, Xemnas will allow Sora and Riku to drop down. He will then teleport around the battle area, shooting threads of dark energy that can be dodged via Reversal. When Xemnas reappears, he uses a clone in an attempt to trick Sora. Attacking the wrong Xemnas will result in the true Superior slashing with his Interdiction or dealing a devastating roundhouse kick. 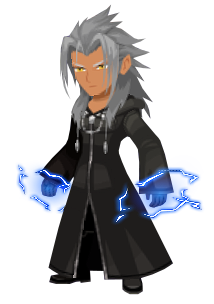 As his HP depletes, Xemnas will shoot energy balls that explode to both block and cause damage. When it depletes even further, he begins to teleport rapidly, encircling Sora and Riku with lasers. He and his clone may then appear together or separately to shoot at Sora. These moves can be avoided via Reflega or Guard and if willing to be wasteful while possibly dealing damage, a Limit. Once these tactics are completed, Xemnas will trap Sora, slowly draining his HP. 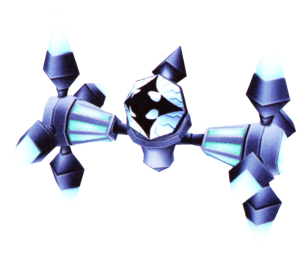 This forces control over Riku, who only can jump, cast Dark Aura, and attack. While Xemnas drains Sora, his clone will attack Riku with energy balls, slashes, and even the damaging shield tactic. The clone can be annoying, but Dark Aura will stun him just a little. Use this time to run to the real Xemnas and Sora, using Dark Aura every three steps until close to the true Xemnas. Jump to him and execute the Reaction Command in order to free Sora, stunning Xemnas. This leaves Xemnas open to major damage. However, the attack can be completely avoided: when Xemnas says, "Can you spare a heart? ", cast Reflect or initiate a Limit just as Xemnas casts his curse on Sora. Xemnas will then repeat the throwing technique used at the battle's start, as well as his normal attack pattern. Just before Xemnas's HP hits zero, he fills the battlefield with lasers, shrouding the area in darkness. At this point, repeatedly mash and in order to keep Sora and Riku alive. Failure to do so will spell certain death. An easy way to do this is to rotate your controller vertically, put your left thumb on and right thumb on . Once the area is cleared of lasers after 30 seconds, brief cinematics are shown, eventually reducing Xemnas's HP to 1. From there, simply perform a combo finisher, magic, or a Limit to finish Xemnas off. Riku will heal Sora when his HP is low. Items still should be brought into battle, as it is best to be hit by Xemnas's drain attack with a full bar of HP. Ethers are also good for restoring much-needed MP. While Xemnas's final attack brings him to 1 HP, Sora can deplete his HP to 1 before the attack is executed, as well. Riku cannot die in this battle, because he is needed for the entire battle. The only time that Riku can die is when Xemnas starts to drain Sora's HP. If Riku is defeated before he reaches Sora, it is a game over. In the HD 2.5 ReMIX version of the game, the "Reversal" Reaction Command can show up less frequently. The best way to avoid Xemnas's Invitation to Nothingness in this version is to activate Session, providing Sora and Riku invincibility during the attack. This problem was fixed in the HD 1.5 + 2.5 ReMIX version. Dual-wield Attack (二刀流攻撃, Nitōryū Kōgeki? ): Xemnas slices Sora with his Ethereal Blades. Shot (ショット, Shotto? ): Xemnas fires his Ethereal Blades as projectiles, usually after trapping Sora in a Spark Wall cage or after surrounding him in a circle of Ethereal Blades. Spark Wall (スパークウォール, Supāku Wōru? ): Xemnas throws up a barrier to defend against Sora's attacks and will occasionally trap him in a cage composed of Spark Walls to fire Ethereal Blades at him. Building Throw (ビル投げ, Biru nage? ): At the outset of the fight, and after taking significant damage, Xemnas teleport to the edge of the arena and hurl buildings at Sora. At the start of the battle, Xemnas will hurl two buildings at Sora, then three more. Perform carefully-timed Slide Rolls to avoid them. If left alone during his normal phase, he will casually walk up to Sora like in prior games, but will start to actively attack in response to Sora's offense. Xemnas is incredibly swift, and frequently travels around the battlefield either inside an impenetrable sphere of darkness or by teleporting from place to place, attempting to catch Sora from behind. As soon as Xemnas reappears from the dark sphere, Lock-on to him and press to guard against the ensuing Ethereal Blade combo or roundhouse kick, leaving him open to Sora's Counter Rush. The Slide Roll/Sonic Impact/Double Impact/Sliding Sidewinder combo is also efficient at repelling Xemnas and causing him to flinch and getting knocked away, and powerful Unison Attacks like Decussation are useful as well. As with all bosses, if you can create a deck of alternating Balloon- and Cure-type spells, you can easily complete the battle simply by activating the commands one after the other. Should Xemnas surround Sora with lasers, leap over them with High Jump and either use the Air Slide/Sonic Impact/Double Impact combo or avoid them by performing Superglide towards the opposite end of the battlefield. When Xemnas traps Sora in a cage of energy shields, simply High Jump over them and repeat the Air Slide/Sonic Impact/Double Impact combo to avoid the ensuing barrage of lasers; while risky, a Flowmotion attack at this point will halt Xemnas's attacks for a short period. He may try to defend himself with a single energy shield from time to time, but Sora merely needs to stay away from it to avoid taking damage, or allow it to hit him so that he can perform Payback Raid, as the shield does almost no damage. After half of his HP has been depleted, Xemnas resets the battlefield, requiring Sora to time Slide Rolls and dodge the incoming buildings: if Xemnas hurls one building, it will slide across the arena and can be dodged by leaping over it or by Air Sliding into it to trigger Flowmotion. If he hurls two, they will approach vertically, but are be pretty easy to dodge. When he throws three, they will bounce towards Sora while horizontal. After all three sets of buildings have been thrown, Xemnas throws another building at Sora that knocks the battle field and himself into a gliding phase where he cannot move but can still attack. Xemnas will throw another building at Sora, which Sora can use to trigger the Nightmare's End Reality Shift. If Nightmare's End succeeds, the arena will shapeshift to include a long Flowmotion rail with a passive Xemnas at its end. Sora can unleash powerful commands during this time without fear of reprisal, and after a set time, Xemnas will rally and warp the battlefield back to its original state. Using Sliding Dive from the last rail will cause Xemnas to rally immediately. If Nightmare's End fails, Sora will be damaged and the battlefield will shift back to its original form, and the ferocity of Xemnas's attacks will remain normal. After the Reality Shift phase has been done, Xemnas increases the frequency and ferocity of his attacks. If Sora immediately attacks him with the Slide Roll/Sonic Impact/Double Impact combo, he will repeat the latter phase with the buildings. Resume the Guard and Counter Rush and Slide Roll/Sonic Impact/Double Impact/Sliding Sidewinder combos strategy, and use a powerful Link Attack—like Decussation—or Dual Link—like Unison Rush—to finish Xemnas off. 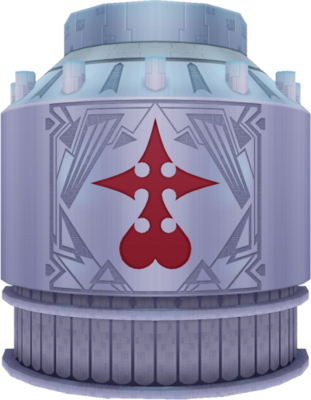 It is advised to bring two Curaga commands into battle to ensure maximum healing potential and cancel out the wait for command reload time should Sora's HP need replenishing. Also bring Spirits that have Curaga and the Haste Support Magic to not have problems with the reload time. Use Flowmotion to Sora's advantage, and the battle should end with minimal difficulty. It is a necessity to enter this fight with a full Drop Gauge and even bring Drop-Me-Nots when at a lower level. 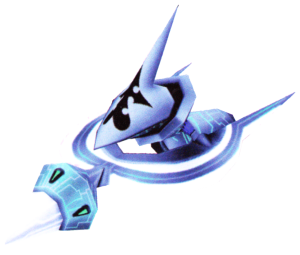 The Sidecar Glider used by Riku and Sora during the second fight against Xemnas's Dragon Form.